A Cardboard Problem: Bubble Mailer Day! I love when I get to the mail box and there are bubble mailers stuffed in there. It makes my whole day. See, it doesn't take much folks. Both of these were from trades, and from great people as well. 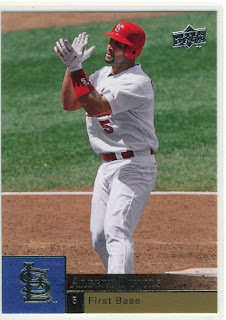 The first package I opened was from Heartbreaking Cards and it was the missing link I was talking about earlier. 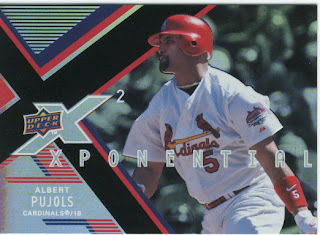 Drumroll please..... 2008 UD X XPonential 2 Albert Pujols!!! 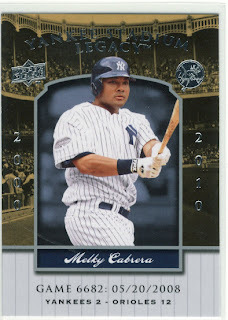 After months, and months of searching for this card it is now mine... all mine! Thanks so much, Matt! First time trading with him and it was awesome. Thank you so much Tricia!!! 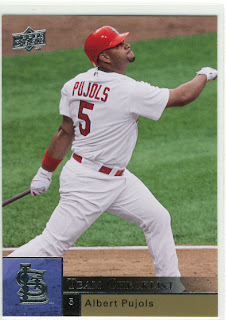 The YSL All-Star Game card will probably be forever one of my favorite cards from this set simply because I was at that game. The whole All-Star Game experience from Fan Fest, Homerun Derby, and the All-Star Game were all experiences that I could never put a price on. I would have sold my soul to be at those events, and thankfully I was able to purchase all of the event tickets because I am a season ticket holder. Sooz and I went to Fan Fest together and had a blast, and for the Homerun Derby and All-Star game we were both there but she was working and I was playing. I can definitely see why Tricia likes Hamilton, any guy that can smash homeruns off the back wall of Yankee Stadium is okay in my book. Sadly, I don't remember taking any pictures of these events. I think I was just interested in taking it all in and remembering it and not trying to worry about pictures. 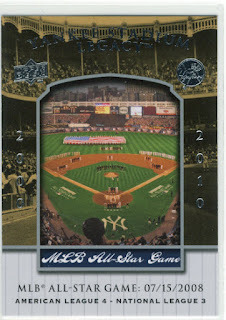 That All-Star Game '08 may be the nicest Yankee Stadium card I've ever seen. I want that card so bad. Fan fest was awesome. Took the wife and kids. My daughter and I both got Upper Deck cards made for us. We found the Topps "card shop" too late and the line was ridiculous. Where's the all-star game this year? We had a great time at Fan Fest as well. Next year it's in St. Louis.